What do you get when you mix a premium blend of today’s best athletes, progressive artists, and flavorful musicians? This recipe for awesome is called Gravis, and they are the ones responsible for cranking out batch after batch of functional, stylish, athletic shoes and accessories. Their eclectic mix of influences give way to the highest caliber products that speak to a lifestyle that settles for nothing less than the best. When 1998 rolled around, the Burton Snowboard team conceived an idea that would soon lead to a footwear brand that fused together the worlds of action sports and tasteful style. By putting heavy emphasis into research and development in order to achieve a glorious combination of perfect fit and supreme longevity of the product, Gravis had the secrets to success all lined up. Their team of professionals come together to share stories and experiences that lead to merchandise infused by advanced design, unique fashion, creativity, and of course, all the performance necessary for action sports. With a footwear arsenal so vast and varied, it’s a bit tough to narrow your choices down, but rest assured, there is no such thing as a wrong pick when it comes to Gravis. The men’s Cortex Hi Shoe is reminiscent of basketball style and those hardwood heroes. A velcro strap across the top, a breathable mesh lining, and a super cushy sole make sure you are prepared for action whether it be on the court or in the street. High traction outsoles, a dreamy cloud 9 footbed, and a canvas upper make the super light Chuck Shoe an instant classic. When it comes to laid back style, look no further than the Yachtmaster. These slip-ons, with their plaid textile footbeds and suede accents will guarantee you are master of smooth living. Ladies have quite the foot friendly selection at their disposal as well. A latex footbed, mesh padded lining and fantastic traction of the outsole make the Gravis Tasha Shoe a force of comfortable, stylish, functionality to be reckoned with. Do your feet a favor and introduce them to the likes of the Sierra Shoe. They’ll be thanking you after they get to know the Sierra’s soft canvas lining, EVA sockliner with arch support, and stunning herringbone upper. Slip into the Gravis Eva flats for a cozy, good looking option that goes with any outfit. 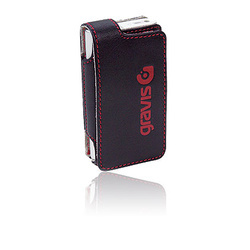 Gravis has the goodies to hook up your personal tune machine with classy protection too. The Gravis Deuce Leather keeps your iPod safe from all the terrible things it might encounter, and also features a flip cover with full access functionality. Also, wrangle all those loose CDs floating around your car with the Gravis CD Wallet. With a refusal to sit anywhere but in the driver seat, Gravis takes the wheel and is steering the industry in a new direction with an attitude and lifestyle brand that other companies can only envy. Don’t get left behind, and jump on for a ride that only Gravis can provide.